Mitt Romney ran for president during the 2008 election season. Romney: "I will be working to help conservatives across the country"
Romney's interview appeared on CNN's "American Morning"
Boston, Massachusetts (CNN) -- For a moment, you might think Mitt Romney was still running for office if you look at his travel schedule crisscrossing the country. Since February, he has attended nine events for senatorial candidates, appeared at more than a dozen rallies or fundraisers for those running for governor this year or next, and spoken at almost two dozen meetings of Republican Party groups or conservative organizations. And he has finished a new book. "This is a pivotal time in the history of our country," Romney said at his political action committee's office. As the Republican Party searches for ways to rebound from its recent losses and leaders who can be turned to, Romney clearly is trying to position himself to be one of them. "I am just one force among many. But a time like this, I think the party is looking for voices that lay out a positive ... vision for the future of this country and for our party. 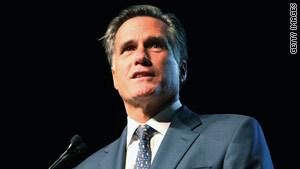 If I can be part of that, so much the better, and there are a lot of good voices out there," Romney said. "I appreciate the fact that others disagree with me on some issues, but that kind of debate at a critical time like this is good for the country." Romney campaigned for both of the recent successful GOP gubernatorial candidates -- Virginia's Bob McDonnell and New Jersey's Chris Christie -- and said he plans to stay on the stump through next year's midterm elections. "From now until November of 2010, I will be working to help conservatives across the country," the 2008 presidential candidate said. "The country, in my view, is being taken a direction that is very damaging, and I think people want to see a strong return of fundamental American principles." As to the current state of the GOP, he maintains that the party is seeing new blood and has been rejuvenated by President Obama. "I think you are seeing Republicans from both sides of the spectrum becoming more and more enthusiastic, more excited about the future and more anxious to see change in Washington." Romney stayed neutral while several Republican leaders, such as former vice presidential nominee Sarah Palin and Minnesota Gov. Tim Pawlenty, endorsed third-party conservative candidate Doug Hoffman in New York's 23rd Congressional District race over moderate Republican Party candidate Dede Scozzafava. Although some in the party believe that it should be tilting right in whom to support in future elections, he said, "I will be by and large supporting conservative Republicans" but would not rule out backing some moderates, referencing former President Reagan. "He was the one who coined the term 'the big tent.' He also said that you don't build something by subtraction. So we welcome people who agree with us on most issues. Some will be very conservative on some issues. Some will be less so on others. We welcome you into the party." Romney said those within the party of different ideological stripes can agree on core principles, including strong national security, small government and fiscal responsibility. "They want to distance themselves from the mistakes [that] were made by certain Republicans in the past," he said without elaborating. Whether he is hoping to lead the party into the 2012 presidential race is an open question. He insisted that he would decide whether to make another run only after the midterms. In an October 16-18 CNN/Opinion Research Corp. poll, Romney ranked third in Republicans' choice for a 2012 nominee behind former Arkansas Gov. Mike Huckabee and Palin; 36 percent had a favorable view of him, while 26 percent had a negative view and 37 percent weren't sure. If Romney does decide to make another presidential run, he will have accumulated a lot of political capital that can be a crucial asset. His political action committee, Free and Strong America, has raised more than $2.6 million this year and given out more than $118,000 in contributions, according to financial records and the PAC. The country, in my view, is being taken a direction that is very damaging. He is also trying to shore up his conservative credentials in the wake of criticism during last year's campaign that he was inauthentic for his embrace of conservative positions on issues such as abortion, which he was more moderate on as governor of Massachusetts. The entrepreneur has criticized the $787 billion economic stimulus plan as emphasizing too much spending and not including enough tax cuts. "Don't waste any more money. Stop using the stimulus to grow government. Instead, restructure what's left to encourage the permanent acquisition of jobs," he said. Several of his potential challengers in a possible Republican nomination fight, including Huckabee and Pawlenty, have criticized the Massachusetts universal health care plan Romney helped create as governor. Although the state has greatly expanded the number of residents receiving insurance coverage, the costs have exceeded estimates. "Seventy-five percent of those in Massachusetts said they don't think it is a success," Huckabee said at the Family Research Council's Values Voter Summit in September. Romney has not backed away. "We have a plan in Massachusetts that is working pretty well. It has flaws. It's not perfect, but it is making a difference here," he said. "We found a way to get everybody insured in the state, and we did that without a public option -- no government insurance and without the need of raising taxes." At the same time, he is trying to use his experience on the issue as a way to attack the Obama administration. There has been "no interest in [the] part of the administration to speak with me or come and really analyze what is really good about this system or what is really bad. Instead they have their own plan without input from Republicans, and I think that is very different from what people expected from this president." Romney called Obama a nice guy and said there are some areas they agree on, such as the president's trip to Copenhagen, Denmark, to lobby for the Olympics to come to Chicago, Illinois. But "he's just wrong on most big issues," the former head of the 2002 Salt Lake City Winter Olympics said of the president. Some of Romney's toughest criticism of the president has come over foreign policy. "I think he has made America less safe in that our friends are more concerned about the reliability of the United States," he said. He pointed to such moves by the administration as pushing Israel to freeze settlements, the redesign of the missile shield program in Europe and the review of the Afghanistan war strategy. "This president says he needs some time. Four months? Nine months? We have men and women dying in Afghanistan. They need to know if they're going to get reinforcements and the support they need, or is this president going to take a different course?" CNN's Jessica Yellin contributed to this report.